JERUSALEM: Palestinian militants fired three rockets at Israel overnight prompting retaliatory fire from Israel, with the exchanges threatening a Hamas-declared truce. Calm returned later yesterday, though there were concerns the first anniversary of mass protests along the Gaza-Israel border on Saturday would lead to further tensions. A big turnout is expected for the anniversary of the marches, which have been calling for Palestinian refugees to be allowed to return to their former homes now inside Israel. Israel says such calls amount to a campaign for its destruction and accuses Hamas of orchestrating violence along the border. The protests have drawn a deadly response from the Israel army, which says its actions are necessary to defend the border. More than 200 Palestinians have been killed by Israeli fire and one Israeli soldier has been killed by a Palestinian sniper. Palestinians and human rights groups say protesters have been shot while posing little threat. 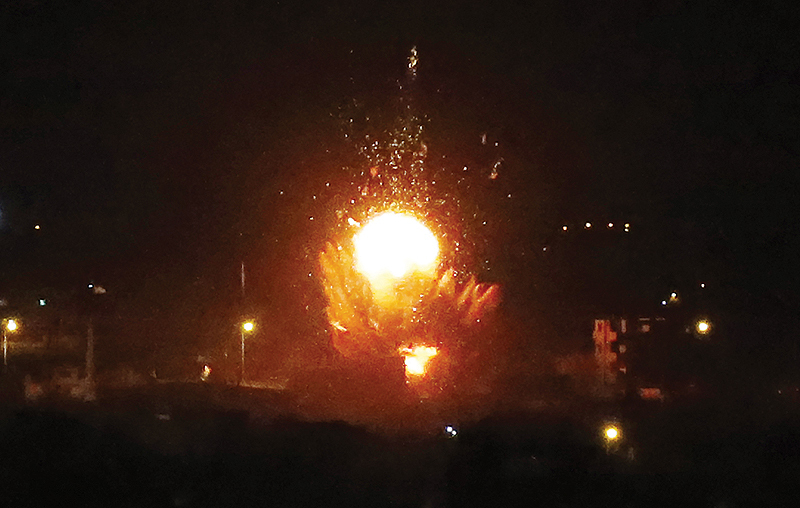 The exchange of fire overnight came after Prime Minister Benjamin Netanyahu said he was prepared for further military action in Gaza, at a highly sensitive time ahead of an April 9 Israeli general election. The latest severe flare-up began early Monday when a rare long-distance rocket fired from the Gaza Strip hit a house north of Tel Aviv, wounding seven Israelis. The Israeli military hit back with air strikes across the enclave and Palestinian militants launched a further barrage of rockets. No casualties have been reported. Calm prevailed throughout yesterday, with Hamas claiming Egypt had brokered a ceasefire, but as night fell Israel said a rocket was fired from Gaza. In response, a military statement said “fighter jets struck several terror targets in the southern Gaza Strip, including a Hamas military compound and a weapons manufacturing warehouse in Khan Yunis.” A Palestinian security source said an air strike hit a Hamas military base in Khan Yunis, in southern Gaza. Shortly before midnight, the army reported a second rocket attack, this time on an industrial zone on the edge of the Israeli coastal city of Ashkelon. Hamas, its main Gaza ally Islamic Jihad and smaller groups took pains to disassociate themselves from the incident. “The rocket that hit near Ashkelon was the work of an individual and the factions are committed to calm” as long as Israel is, they said in a joint statement. Early yesterday, Israel struck back. “Fighter jets and aircraft struck several terror targets in the southern Gaza Strip in a Hamas military compound in Rafah,” an army statement said. Before dawn, another rocket was fired at Ashkelon but was brought down by Israeli air defenses, the army said. Netanyahu, who cut short a high-profile visit to the United States to take charge of Israel’s response, said Tuesday: “We are prepared to do a lot more. “We will do what is necessary to defend our people and to defend our state,” he told the annual conference of US pro-Israel lobby group AIPAC by satellite link. The army said that after a meeting with Netanyahu — who is also defense minister – chief of staff Lieutenant General Aviv Kohavi ordered more forces sent to the southern border region. Yesterday, a Hamas spokesman said: “The Gaza Strip has lived under Israeli aggression for two days. The Hamas movement has exercised its right to defend its Palestinian people.” “The situation has calmed down after the intervention of the brothers in Egypt and the entry into force of the ceasefire,” said Hazem Qassem.